The Moon symbolizes emotions, moods, intuition, and imagination. 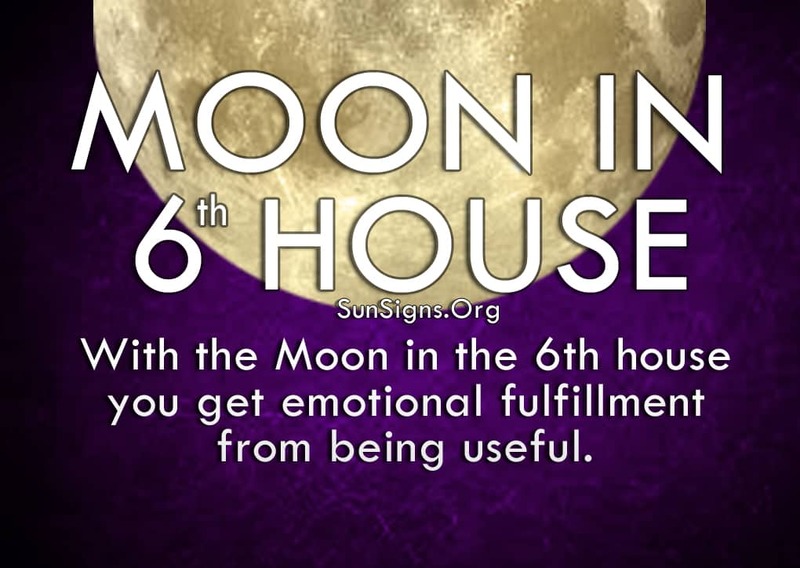 With the Moon in the 6th house, you get that kind of emotional fulfillment from being useful. You always work hard and always need to be doing something to feel productive. While this helps you spiritually, though, it can harm your health. Because you’re always on the go, your life can be a bit chaotic. Your restless nature (thanks to your ruling zodiac sign Virgo) doesn’t allow you to slow down so you create a schedule or routine that keeps you organized and busy. This seems to be the only way to keep you happy and satisfied, although other people may find it tiring to keep up with you. But you’d rather take care of things yourself anyway, handling all of the responsibilities with grace and ease like a true Virgo. The moon in sixth house astrology suggests that you should make sure to ask others if they need your assistance. While you may be the best person for the job, you are not always welcome. Be aware that your kind of emotional fulfillment is different from other people’s satisfaction. This will be difficult for you since you are extremely sensitive to criticism. Most of the time you are able to control your emotions, and the Moon in the 6th house allows you to show how much you care in a practical manner. When people do need you you’re there for them, and they know it. Your acts of kindness rarely go unnoticed, and you will often get the praise you desire for your good deeds. However, if you’re not careful, maintaining that kind of lifestyle can take a toll on your physical and mental well-being. Make sure to take time out of your busy day to do something for yourself. While it may feel unnatural at first, since you are mainly a selfless person, it will feel great after a while. Pampering yourself will allow you to continue taking care of others. But others may view you as irritating, or someone who is looking to take all the glory for something they had no part of in the beginning. While you are simply trying to be helpful you may come off as bossy and should test the waters first before jumping in. But people with moon in the 6th house should not always depend on the validation from others when trying to grow spiritually. You’ll only find it disheartening whenever they have something critical to say. Instead, figure out what makes you happy and fulfills you emotionally, and set up a way to go after it. This will satisfy your need to stay busy and will keep you mentally and physically healthy. No one is perfect, including you, and that knowledge will help you overcome your inhibitions. You can still do good deeds for others. Just make sure to keep your happiness a high priority as well.